SSony Theakanath is the CEO and Founder of Asaii, an automated machine learning lead generation A&R platform serving record labels, Fortune 500, booking and promoting agencies. Coming from Apple, Facebook, Uber, Salesforce, and Yelp, Asaii’s team has built a product which focuses on in-depth analysis and prediction, instead of simply aggregating data across multiple sources. 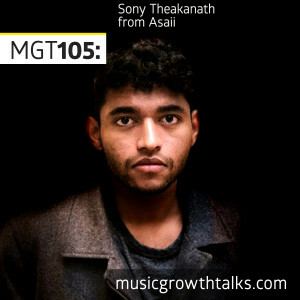 On this Music Growth Talks episode, Sony talked about their Discover and Track products, currently in private beta, and explained how exactly their clients use Asaii. He also shared tips for musicians aiming to be noticed by record labels and industry influencers who use data to discover talent. Listen to the episode in full to hear a new reason (in case you haven’t had enough) not to buy fake followers and listens, and a lot more. Find out more about Music Growth Talks at musicgrowthtalks.com. Subscribe to the podcast on Apple Podcasts, or by searching “Music Growth Talks” in your favorite podcast app. To access a patron-only Secret Music Growth Talks Feed, become Andrew’s patron for $1/mo.